The MLS Reserves: Three Quick Thoughts on SKC and Toronto. Three Quick Thoughts on SKC and Toronto. 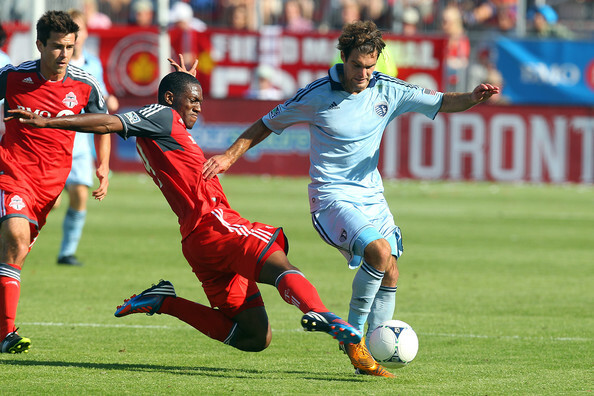 Sporting KC fell to a surprisingly stout Toronto FC side 2-1. After the shock result, here are a few quick thoughts worth considering. How Real are Sporting’s Issues? It was easy to write off Sporting’s poor first-half performance against Philadelphia as a case of new players gelling and first-game rust. But after an uninspiring defeat to a Toronto team that was the worst in MLS last year, the questions are getting louder and more legitimate. It’s obviously much too early to make any conclusive judgments, but for a team with MLS Cup aspirations, the mistakes must be corrected quickly. Peter Vermes’ decided to go with Bobby Convey instead of Sapong on the right wing for the second week in a row. And for a second consecutive week, Sapong was much better than Convey after coming on. He brought a physical presence that helped SKC maintain possession while trying to get back into the game and his flick-on header set up Claudio Bieler’s lifeline goal. Sapong, who played much of his 2011 rookie-of-the-year season on the wing, has been effective out wide in the past. Vermes would be wise to insert the third-year player into the starting XI next Saturday. The Reds put in a very good defensive performance against Vancouver last weekend and were impressive again against Kansas City. Ryan Nelson has clearly instilled a better sense of organization and composure that will make TFC tough to beat this season. If new signings Robert Earnshaw and John Bostock can turn in more impressive performances, Toronto could be sneaky good.